​If you're interested in a custom portrait, please feel free to contact me with any questions. 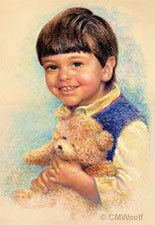 I love to draw and paint portraits, especially of children, and would be very happy to do one for you. Animal portraits are welcome too. Currently I work from reference photos. When possible, I like to take the photos; otherwise, I can work from yours. For some guidance on how to choose a good reference photo, please see the Photo Reference Tips below. I'll review the photos and work from one that you agree to. Print photos will be returned to you when the portrait is done. I'll also provide you with a Model Release Form to sign. A portrait will usually take about one to four months to finish from when your order is confirmed. (If you need it sooner, don't hesitate to ask. It's sometimes doable.) When the portrait is done, if you'd like to see a proof, I can send one to you for your approval. The finished portraits are usually approximately 14 x 11 or 16 x 12 inches (image area), though sizes may be adjusted for artistic composition or your preference. Materials used are archival. Currently I do portraits in either graphite pencil or pastels. I will take great care to paint or draw a portrait that you and your family will enjoy. If in the end, though, you decide you don't want to purchase the portrait, you won't have to. Artist retains all copyrights and reproduction rights to artwork produced. Both pencil and pastel artwork should be matted and framed under glass so that the glass does not touch the artwork. A mat is very important because it separates the artwork from the glass. For pastels, additional spacers can also be used (the framer will know about this). As with all artwork, to prevent fading and damage, please keep it out of direct sunlight, areas of high humidity, and temperature extremes. Pastels are sticks formed out of pure powdered pigment combined with a binder. Artists since the Renaissance have used them, and modern artists love to use them for their broad range of bright colors and versatility of application. 1) Quality: The quality of the reference photo relates to the quality of the finished portrait. Please provide a very clear photo--high resolution digital, or high quality print. Ideally, it should be clear and large enough so that the eyelashes and eye color are visible. It's helpful to have more than one photo to choose from. Also check that the skin tone/color in the photo closely resembles the skin color of the person. If it does not, we could probably still use it, but please also include additional photos that better describe the true skin color. 2) Light: Try to avoid photos taken with a flash or in direct bright sunlight. Too much light washes out the face and its details. Natural lighting is best, if possible. Window light works well, as does bright shade. Usually the goal is to have one side of the face in light and the other side with some shadow. 4) Professional Photos: I prefer not to work from professionally taken photos. But if you do provide one of these, please make sure to get the photographer's permission in writing.